Spring can’t get here fast enough. You don’t have to wait for the flowers to bloom to celebrate the new season, though. We’re welcoming the shift in seasons with a themed gathering that eschews formality and keeps it casual with inspired pieces by the brand Dansk—a leader in stylish, everyday cookware and dinnerware. Hand-painted serveware and fresh color schemes make for a setting that celebrates the light and easy vibes synonymous with spring. Craving a new season fete, too? Read on for our top entertaining tips to host a relaxed, spring get-together. Just add friends. Beloved for their Scandinavian mid-century-style stoneware, Dansk cookware is as pretty as it is functional—which is exactly why you shouldn’t leave it hiding in the kitchen. Unique handles and low-profile pots make the pieces easy to tote from stove to table; while the enamel-coated options come in gorgeous soft colors so you can match them to your décor. Pro tip: Plan your menu based on pieces that will add height, dimension, and color to your table, like this casserole dish that’s perfect for a spring soup centerpiece. Spring is about frivolity. There’s a lightness to everything, a pep in our step with the sun staying out longer, and a desire to get out and have fun. 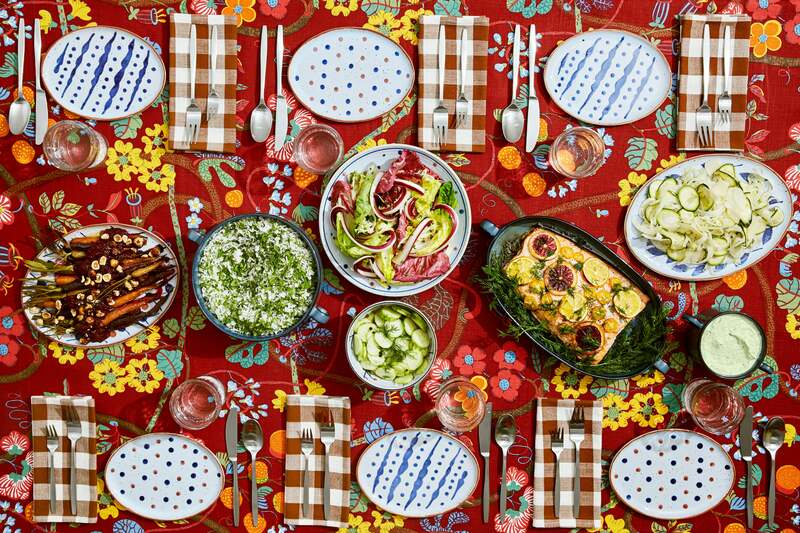 Echo this by choosing platters and dinnerware that feels just as cheerful as the season itself. These designs have a handmade look that works well to promote a casual vibe, while also honoring the fresh buds of spring. Pro tip: Stick to one color scheme or dinnerware collection to ground the look of your table. This allows you more freedom to try other patterns and complementary colors elsewhere. The key to cohesive pattern play is finding a common thread (hint: in most cases it’s color). If your dishes come from one collection, like the Dansk Vandvid, then simply pull from the palette to match up tablecloths and napkins. In this case, the pale reds and variegated blues establish a foundation for darker red textiles that also feature blue. We especially love how the gingham amps up the playful spring theme, while the 1960s-style floral offers a nod to Dansk’s midcentury heritage. Pro tip: Vary the scale of the patterns and consider white space. Here the plates and napkins offer enough white to keep the underlying busy print from feeling like too much. Although oven-to-table cookware and composed salads make quick work of entertaining family-style, don’t forget, you now will have large pots and platters strewn down the table. Avoid over-crowding by laying these pieces out ahead of time—spacing them appropriately to ensure breathing room. Think of your food as the centerpiece and the patterns as your florals, which means you really don’t need much more décor. Pro-tip: Use pieces of paper to mark where you placed things and label them with the name of the dish.